Then click Preview. SankeyMATIC will automatically lay out a diagram connecting all Source and Target “Nodes” using Flows with proportional thicknesses. Getting Data from a Spreadsheet? Note: Node definition lines can occur anywhere in the input; they are not required to be in a specific order. Something closer to a square? These three examples all share the same inputs. Experiment with the Diagram Width and Height settings to find what shape communicates your data most clearly. Small spaces between Nodes lead to crowded or muddy diagrams, difficult to parse visually. 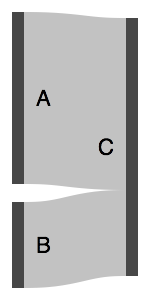 Large spaces between Nodes lead to thin spidery Flows, making differences between them harder to distinguish. Find a happy medium appropriate for making clear comparisons between Flows. In the Colors control panel, for Node Colors you can have SankeyMATIC assign colors to your Nodes from the themes shown on the right. Or, you can set all Nodes to a single color that you choose. For help choosing specific HTML color codes, there are many sites you can visit for help; search for HTML color codes. Use the Source Node's color: Every Flow will adopt the color of the Node it is flowing from. Use the Target Node's color: Every Flow will adopt the color of the Node it is flowing to. Use a single color: All Flows adopt the same user-specified color. Note: Since Flows are more transparent than Nodes, the Flow colors will appear to be a lightened version of the Node colors. To control the lightness/darkness of all Flow colors, use the Flow Opacity slider; the closer you get to 1.0, the stronger the colors will be—however, if any Flows overlap, making them more opaque will make it harder to see the covered-up Flows. You can override the general settings for Flow colors mentioned above by defining a Node as coloring the Flows to the left of it, or to the right, or both, by using the special tokens “<<” and “>>”.